At Ratna Park bus station in Kathmandu we get on a bus to Dhulikhel. 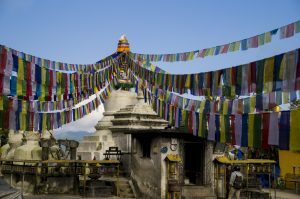 From there we take a taxi up the hill to Namo Buddha Monastery where we chant with monks, live on rice and beans, meet adorable children en walk past stunning stupa’s, covered in Tibetan flags. 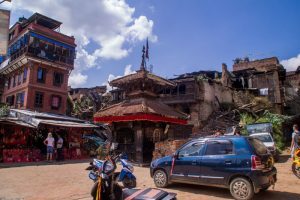 On the way back we stop in Bhaktapur to see beautiful UNESCO sites like Durbar Square and Parsupinath Tempel. 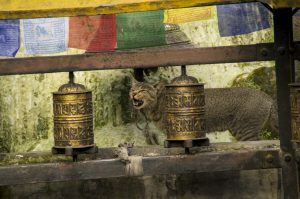 Outside of Kathmandu there are many sights worth a visit. Some on a very short distance, which makes them highly recommended for a day trip from Kathmandu. 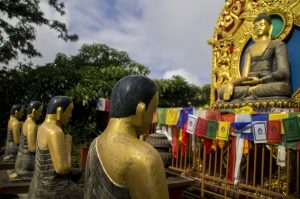 A bit further away you’ll find destinations for an overnight trip, like Namo Buddha. A monastery where we went by bus and stayed for one night. From there it’s easy to take the bus to Bhaktapur to spend another night and explore this beautiful, ancient city before hopping on the bus back to Kathmandu. Back in Kathmandu we took another bus to the close by Buddha Stupa, which you can read about here. 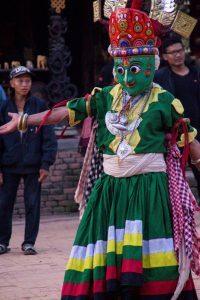 So a lot of things to see and do close to Kathmandu in only 3 days. Public transport in Nepal is by far not comparable to western public transport systems, like in the Netherlands. Taking the bus is quite the challenge for the average tourist, even though it’s certainly not impossible. Beware of rip offs by asking at least 3 people on the bus for the price of a ticket. This way when leaving the bus, you know how much to give the person handling the money and they can’t overprice. The ‘system’ on Nepalese buses can be confusing at first, but if you pay attention you’ll soon notice that there actually are bus stops. Bus stop signs are covered in a thick layer of brown dust, and sometimes they’re just not there, so it’s not easy to spot them. It’s easier to recognise a bus stop by the large amount of people waiting somewhere, and by buses passing by on a low speed while yelling the destinations to the people waiting. Of course, as a tourist it’s impossible to know which bus you should take by what the guys on the bus are shouting from the door. What you do is you shout your destination first, and they will reply with a quick headshake (saying no) or they will stop the bus for you. You can also ask another waiting passenger to help you catch the right bus. You’ll notice Nepali people are very friendly and willing to help, even if they don’t speak much English. What helped us a lot is pointing out our destination on our Maps.Me app. When you managed to get on the right bus, just ask a few people for the price of a ticket. Most of the times in our case, in 2017, it was 20 to 25 Rupees per person, unless you’re in the bus for over an hour. Make sure you have enough coins with you, so you don’t have to wait for your change. In most cases we found that this is a waste of time (and money!) because they will just tell you you’ve paid the right amount, and discuss for so long that the bus has to leave and you will be standing there without any change. You just made it a little bit too easy for the guys working on the bus to rip you off. If you pay the right amount they will yell at you anyway, trying to convince you it’s not enough, but just walk away in that case. They won’t come after you, so you know it actually was enough. Taxi’s are by the way the best way of travelling short distances like to and from Thamel, Kathmandu’s tourist neighbourhood. The amount of taxi’s most of the time is higher than the amount of tourists, so it’s easy to bargain. Decide for yourself the price that you are willing to pay and don’t exceed this price. You will find a taxi driver that’s willing to drive you for this price in 5 minutes. When you ask for a price, your counter offer should be lower than half that price. If you end up paying half, you did a pretty good job. Do you have any local contacts? Ask them beforehand what’s a normal price for the taxi. Probably you will still pay like 100 or 200 Rupees more than what they told you, but that’s a fair price for a tourist. 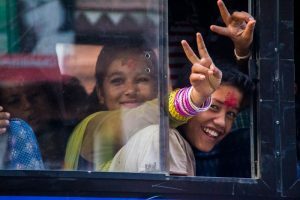 We decide to take our chances and for the first times in our lives, we’re on a Nepalese bus. First we have to get to the Ratna Park bus station in Kathmandu, and from there we take a bus to Dhulikhel. Unfortunately, this very first bus turned out to be going in the wrong direction. Luckily we found out in time and got on the right bus with some help from the locals. As soon as we hop off the bus, the guy working there claims that we owe him 100 rupees per person for that short ride. What?! We know that’s no true. It takes at least an hour to spend 25 Rupees on a Nepalese bus… Riny gives him 40 for the four of us and we take off. Luckily he doesn’t follow us, so I guess this amount of money was enough. Our Dutch friends that we’ve climbed Mount Everest with are joining us on this trip to the Namo Buddha Monastery and Bhaktapur. Such amazing company these guys are. It’s going to be hard to say goodbye to them after a month of travelling together. The road to Namo Buddha is beautiful. 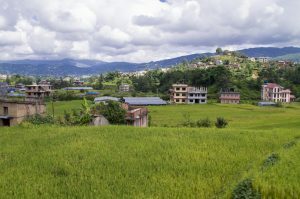 Suddenly the busy, crowded city that’s called Kathmandu ends, and we’re driving through huge, green fields and hills and through cute, little towns. 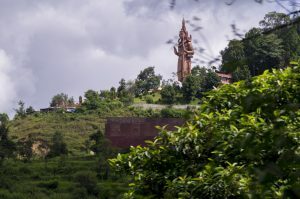 Suddenly we see a huge, golden Buddha statue on top of a hill, and we even got a picture of it from the bus. Luckily I got a seat at the window. This helps with taking pictures, but it’s also incredibly hot in the bus. 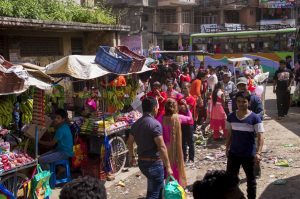 There’s a sort of system to fit as many people in the bus as possible, and all Nepali people seem to know about it. In the aisle in between 2 chairs there has to be two people standing back-to-back. Apparently this is the most efficient way of standing in a bus. Of course we’re being all Dutch and Western about it and we get very annoyed by all the touching of strangers asses. After a lot of shouting from the guy that works on the bus and hand gestures from everyone on the bus, we finally get it and stand in the isle according to proper Nepalese manners. Hot and sweaty as it should be, and for our men without the ability to stand fully upright. Anyway, we arrive in Dhulikhel after about two hours. To us this sounded like a big city, but apparently it’s not. We ask for the bus to Namo Buddha and after asking 5 different people, we finally find out that this bus won’t be here for another hour. It’s very hot today and we actually don’t feel like waiting that long at all. Maybe we should look for a taxi instead. At that moment, a car stops and ask us where we need to go. He’s going to Namo Buddha and offers to take us with him for 2000 Rupees total. Well, that seems like a lot of money to me. We agree on 1400 and hop in the car. It’s a long, bumpy road with lots of turns and not much space for oncoming traffic. When we see a bus struggling to get past us on the edge of the road, we’re quite happy to be in this car. It’s worth every penny, especially because this bus even seemed fuller than the one we were in just now. I didn’t think that was possible! 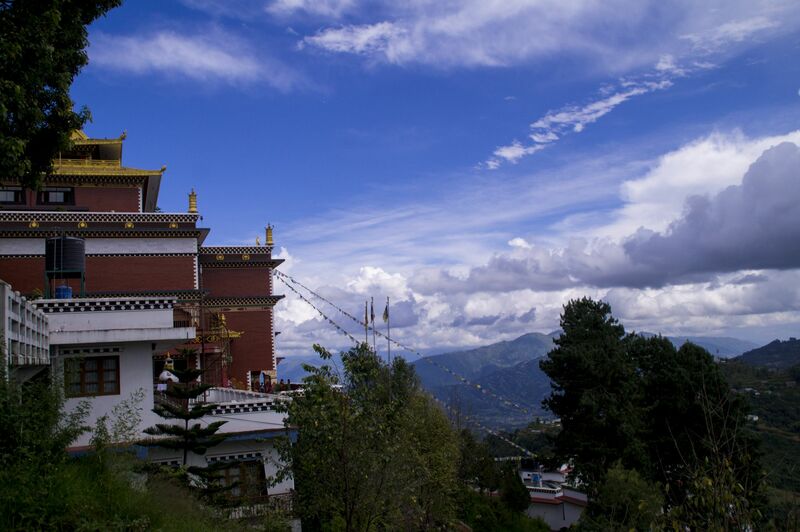 We’re happy to arrive safely on top of the mountain where the Namo Buddha Monastery is located. 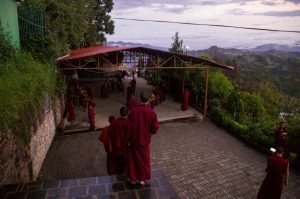 Many young boys from poor families are send here to get a proper education and to eventually become a monk. The monastery lives of donations and needs these pretty bad. It’s a very special place to be and to spend the night. We check in to our two rooms in the new guest house on the huge property of the monastery. We get to share two meals with the monks and sit in on two ceremonies. The first ceremony is at 4 pm and lasts one hour. It’s in a gorgeous hall, full of colourful ornaments covered in gold. At the front there’s a long line of huge, golden Buddha statues with a sort of altar in front of them. In front of that, there are about 10 rows of pillows for the monks to sit on. We’re allowed to take place on a pillow in the last row, which costs us a lot of effort to sit on for a full hour. Listening to the humming sounds of the monks we stare at the many bald heads and orange cloaks in front of us. It’s a very soothing experience. 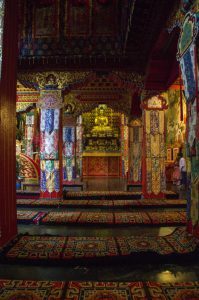 The prayers are spoken by the monks but it sounds more like hypnotizing singing. It makes it hard to maintain your focus for one hour, that goes for some monks as well. 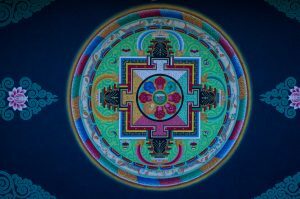 Luckily they sometimes sound the trumpet and the gong which prevents us from falling asleep or sometimes wakes us, and some of the monks, up. Dinner is being served at 6 pm. All monks sit down at an empty table, on a small wooden bench in lotus position of course. Monks who are ‘on duty’, I think, are handing out bowls and cutlery and soon after that they serve dinner. Because there are so many monks here, there’s no money for delicacies. There seems to be not even money for any kind of seasoning, but then again that’s not the Buddhist way anyway. A simple life also means simple food. White rice is being served with a sort of soup made from brown beans. It tastes pretty good actually. The monks don’t need an awful lot of time to finish their bowls and as soon as they’re done they are excused. There is no waiting for everyone to finish and most tourists are left alone on one side of the hall after 5 minutes. Very extraordinary to witness such a cultural difference. The monks use spoons to eat their food instead of their hands, which was something that I was not expecting. During the evening there’s not much we can do. The entrance gate to our guest house closes at 10 pm so by then we should be back, but we are back way before that. Tired of the long journey we go to bed pretty early. 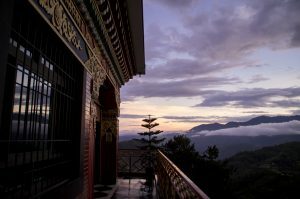 Tomorrow is going to be an early rise to see the sunrise on the top of the mountain on which the temple is built. The alarm goes off at 6 am and it’s pitch black outside. We decide to get up anyway because we have no idea how long the walk will be to the stupa on the top. Outside everything is quiet and dark, except for a single light behind a window every now and then. It’s rather chilly at the top, we are no longer used to these temperatures. Of course we make it to the top way too soon, because it was only a 5 minute walk, haha. We have to wait a long time for the sun to rise. Especially because today the sun decided to stay behind the clouds, bummer! At 7 am we are back in the big hall on our pillows to attend the ceremony. We were hoping to see a few changes compared to yesterdays ceremony, but to us they look quite similar. At 8 am we are off to have breakfast with the monks. The ritual is the same as yesterday, but the meal is different. It’s not a breakfast we are used to. We’re having some sort of sticky bread that looks more like raw dough and on the side are some beans in a watery sauce. It’s a little weird but it tastes pretty good, to most of us at least. After breakfast we decide to walk towards another stupa. We pass along the backside of the monastery, past the stupa where we were this morning, through a small village where old local women are watching us curiously. They are very friendly and tell us which way to go. 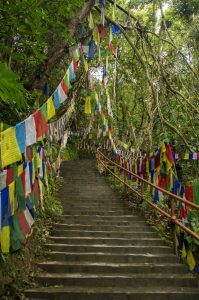 A beautifully decorated stairway with hundreds of Tibetan prayer flags leads us down. Once we’re at the bottom, there’s a big stupa in the middle of another small village. A few adorable, but a bit dirty, kids are playing here and they would like to take a picture with us. Very amusing! Especially Winnie loves it a lot and when she also spots a few kittens she’s totally in love with this place. About half an hour later we leave the square, the kittens and the children, that have been photographed form every angle, and continue our way up through the village to make it back to the guest house. We have spent enough time here to see the monastery and the beautiful environment in it’s full glory. 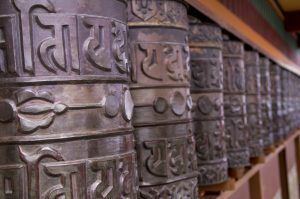 It’s a fun way to experience Buddhism for the first time and we would recommend this to anyone that has a few spare days around Kathmandu, especially because of the amazing environment and atmosphere up on that mountain. If you would like to stay there you can send us a message or try book it yourself here. 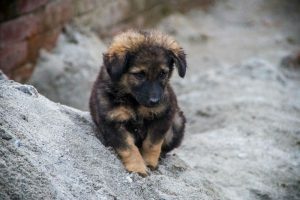 We will then refer you to our Nepali contact and he can give you the number you need to call to make a reservation at the accommodation next to the monastery. It’s not cheap, 2000 rupees per 2 person room including breakfast and dinner. But all the money that is made with renting out these rooms goes to the monks. After having packed our bags we start looking for a bus. According to the locals the bus should be here in about an hour, so we have some time left for a cup of coffee in a small cafe at the bottom of the monastery. We ask some more people about where we should wait for the bus, without getting a definite answer. We suspect the bus will stop a few hundred meters down the mountain, so it’s time to start walking down. At an intersection there are some people sitting and they tell us that the bus is only for locals since today is a festival day. A bus stops, but that one is going the wrong way. We do see that it’s totally packed with people, all dressed up in beautiful colours. Most likely we won’t even fit in a bus today with all these people going towards Kathmandu to celebrate the festival. We decide it’s time to start walking downhill and just hope we will find a bus or a car, willing to take us with them. After having walked for about an hour we see a big pickup truck that could bring us to Kathmandu easily. We ask the driver how much it would be to take us, but he doesn’t really want to help us because he says it will be 6000 rupees. No way we will pay that much, so we continue on foot. A few hundred meters along the way we discover that we’re going in the wrong direction. We have to walk back and we start to get a bit cranky and feel like nobody is willing to help us out here. We pass the pickup guy again, but the price hasn’t changed yet. Ten minutes later we meet a family with a little girl who are also walking towards a bus. They are walking the same direction as we do, so finally we are going in the right direction. We follow them along a small forest track up the mountain and at the top we see the same pickup truck again… There are about 10 people standing on the back of the pickup, but there’s still space for us. For 500 rupees in total we are allowed to come along, yaay! Quite a difference compared to his first price. We know we are still paying 10 times more than the locals but we are happy to get away from this mountain. After a bumpy road and sore hands from holding on to the railing, we arrive in Dhulikhel again. From here we take a bus towards Bhaktapur. Bhaktapur is a lovely city, about an hour from Kathmandu. Getting there by bus is easy and cheap. All you need is a little help to find the right bus, because this is impossible if you don’t speak Nepalese. People are friendly and helpful so this shouldn’t be a problem. 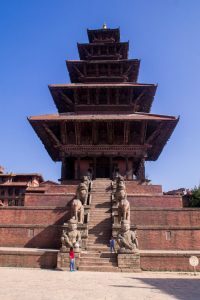 Bhaktapur is an UNESCO World Heritage site and therefore the entrance fee to enter the city is 1500 rupees per person. Make sure to not lose your ticket, because you easily walk out of the city centre and if you want to get back in, you will have to show your ticket to the police. 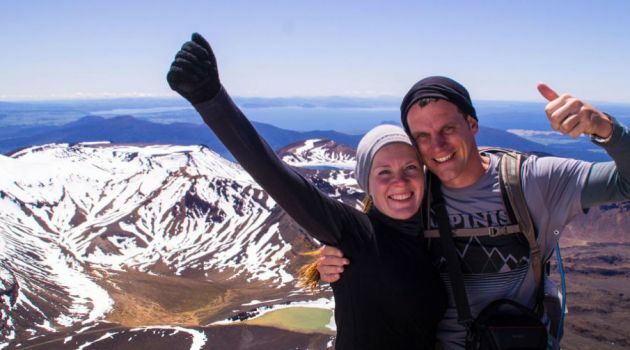 A good idea is to ask tourists that leave the city if you can buy their ticket. Make sure to check the expiration date on the ticket though, mostly written on the back by hand. If you can use the ticket for that day and you don’t go out of the city centre any more you’re fine. We booked a hostel in advance, Delight Guest House, because Bhaktapur is a touristic hotspot and we didn’t want to risk walking around with our backpacks for an hour in the burning sun like we did in Brazil. The guest house is cosy and we have a private room with on suite bathroom, which is even clean! It takes some time getting used to the view though… The city has suffered big time from the 2015 earthquake and there is still debris everywhere. 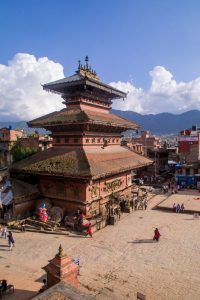 It’s a shame because this is one of the oldest cities in Nepal and it has a lot of highlights that are UNESCO World Heritage. Luckily most of these were left unharmed. There are some really beautiful squares like Durbar Square (yes, the same as in Kathmandu), Taumadhi Square and Potter’s square. The city has a touristic, cosy atmosphere and you can easily spend two days here looking at all the highlights. We followed the route that was in our Lonely Planet, but that was a bit disappointing. 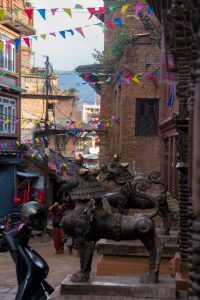 Just make your own route, sit down at a cafe on Durbar square, eat local meals and be surprised by all of the things you run into in the streets. Like in our case, a parade with men dressed up in colourful clothing, making music and performing on the streets. Later on we heard this was a holy ritual. There are a lot of nice places to discover, like small restaurants with gorgeous, massive inner gardens that you don’t expect. Make sure to check TripAdvisor when planning what to see and where to eat.